Vanishingly few 20-plus-year-old record labels manage to remain as relevant, innovative and plain-old good as Perlon has. As we learned while making our list of the best techno imprints over 20 years old, not many are even still in business by the time what would be their third decade rolls around. Not only is Perlon still producing new releases every few months; they’re still producing damn good releases from many of the most exciting artists in their related field. Founders Markus Nikolai, Zip and Chris Rehberger built a stable of regular contributors that included lauded minds like Ricardo Villalobos, Baby Ford, Matt John, Luciano and Thomas Melchior. Their ability to identify and recruit the most inspiring minds in styles that have some relationship to the genres “minimal” or “tech-house” made Perlon one of the most influential German dance music labels ever. While it’s common for fans to slip into such hyperbole when describing its catalog, it’s only fair to note that the curators’ dynamic ability to adapt to any and all trends and developments in funky minimal house and techno has also led them down what we consider in hindsight to be some rather questionable paths. Nevertheless, its consistency and sustainability is an impressive and influential achievement, and the full catalog contains many more highs than lows. With that in mind, we took great pleasure in looking back through the label’s entire discography to select what we consider to be the absolute best Perlon jams ever released to honor its 20th birthday. If you’re interested in celebrating this momentous occasion in person, we’d recommend marking your calendars for this weekend’s 48-hour Perlon extravaganza at Berlin’s Funkhaus. This was the first strike from Zip (AKA Thomas Franzmann) as Dimbiman. 20 years on, “Good Morning, Eyeball” is still one of Perlon’s biggest tracks. It’s a prime example of the label’s early stripped-down and minimalist funk. All Zip needs is a bouncy bassline, a pitched down vocal, a couple of disorienting vocal shards and some shuffling hi-hats to create a hypnotic, drugged-out groove that has proven time and again to have a firm grip on dancers the world over. 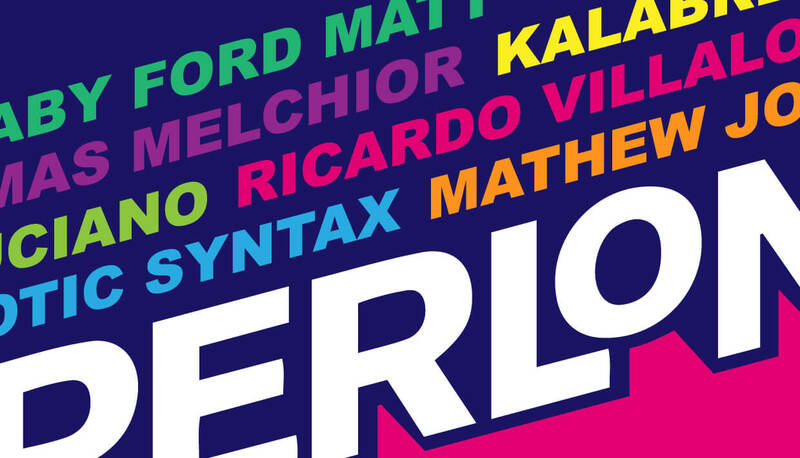 Matthew Herbert circa 1998 and Perlon: a match made in oddball minimal house heaven. His “D-D-D Dazzle Dub” infused the dry minimalism of Dimbiman’s original with the remixer’s trademark playfulness and lots of swing. When the elastic bassline finally hits two minutes into the track, chances are you are already deliriously jacking to the remix’s crisp, skeletal bump. And don’t get us started on the funkified vocal samples. Serious Herbert magic. Ricardo’s first Perlon release is (unsurprisingly) one of the label’s early and all-time highlights. The title track is an introverted and blue ride with Ricardo’s intuitive drum programming. Back then, he was still a tad more dance floor-focused then he is today, and erratic 30-minute jams were the exception—not the rule. Actually, clocking in at nearly nine and a half minutes, “Frank Mueller Melodram” could groove on for at least another five without feeling annoyingly repetitive. In the mid-’90s, Pile, the trio consisting of Perlon founders Zip, Markus Nikolai and graphic designer Chris Rehberger (who was also responsible for Perlon’s signature eye-catching visual aesthetic), accidentally got a major label deal with Epic. They had produced music to accompany a book with Rehberger’s graphic designs, which Epic picked up after a chance meeting with one of their A&Rs in a Frankfurt club. They released an album and a couple of singles with reduced house abstractions and downtempo atmospherics before they decided to form their own independent label: Perlon. They only released one collaborative 12-inch on the label, and “Perlipop” is that record’s standout track. It’s not much more than a stripped-down groove until it gives way to an unexpectedly soulful vocal and some sweet chords. Rehberger is still Perlon’s head graphic designer, but Markus Nikolai is a different story. Is he still involved with the label, or is he still working as an optician? So many questions! For us, “Spritzcussion” is without a doubt the strongest Villalobos production to appear on Perlon. While many of his other Perlon contributions explore depth and emotion, “Spritzcussion” is an undiluted and hazardously effective DJ tool. His masterful use of detailed percussion here gives the track a quakin’, shakin’ momentum and a zaniness that doesn’t interfere with its grooviness. Even in the context of the first Superlongevity compilation, which came out in 1999 with a number of truly visionary tracks, “Spritzcussion” is an absolute show-stopper. Markus Nikolai’s “Bushes” is to Perlon what Isolee’s “Beau Mont Plage” is to Playhouse: the label’s first crossover hit that opened the door to the UK (and beyond). In the process it attracted the attention of Luke Solomun and Derrick Carter, who licensed the title track to Classic and its b-side, “Passion”, to Solomun’s Music For Freaks. Back in 1999, that really meant something. The UK was starting to recognize the different minimal takes on house music coming out of Germany or via German labels, and Perlon was one of the leading forces in that movement. While Akufen was admittedly responsible for some of the Perlon releases that aged the worst, this cut from Superlongevity 2 is a timeless groove. Ricardo Villalobos featured it early on the tracklist to his Love Family Trax DJ mix CD, alongside his own contribution to the compilation, “Panpot Spliff”. Released in the spring of 2002, “Elastobabe” hit the shops just in time to become a staple at the newly inaugurated Perlon parties in the garden of Berghain’s predecessor, Ostgut. The open-air dance floor held many ecstatic Sunday afternoon congregations. Soul Capsule’s remix injects the brooding and abstract original with a touch of trippy soulfulness and an irresistible groove. This is minimal house psychedelia of the highest order. In 2003 Mathew Jonson and Luciano were two fresh-faced kids from the block taking the minimal house and techno world by storm, so just the idea of them working together on music was cause for nervous anticipation. “Alpine Rocket” brought the best of both of their sounds together: Luciano’s crisp, glitchy beats and percussion and Mathew Jonson’s time-honored chords and sequences. It all coalesces in a 10-minute, mind-melting journey down the rabbit hole. Perlon stable member Baby Ford joined forces with his Minimal Man co-conspirator Ian Loveday on “Chicken Store”, a fidgety, jacking little trip. This is an essential crash-course for anyone new to the Perlon sound and experience—a gateway drug to the wonderful world of tech-house, if you will. “The Later The Evening…” is an extraordinary entry in an extensive discography by a groundbreaking producer. In the domains of subtlety and timeless grooves, it competes only with other Thomas Melchior productions like “Feel Sensual”, which we’ve deemed a runner-up. It’s wobbly, skipping beat and see-saw bassline make it a sophisticated late-night jam that will never go out of style. This was one of Matt John’s biggest hits. When it was finally released by Perlon in 2005, the track had already been a sure shot at notorious after-hours gigs like Beatstreet and Bar25 for some time. There are many people for whom Matt John’s first record marked the return to the “classic” Perlon sound: tipsy minimalist house wth a sense of humor and a soft spot for substantive psychedelia. Every element on “Purple Saturn Days” is dense, from STL’s oft-deployed thumping-kick and chunky-hat combo to the layers of glittering ambience that coalesce into the track’s astral melody when the drums finally drop after over six minutes of pure texture. It’s a great example of many of the most charming calling-cards of Stephan Laubner’s best work (those drums!) and the leader on a killer first appearance on Perlon, The Early Days EP. All of these tracks are winners. This is one of the few Cassy tracks that doesn’t feature her own vocals. The TR-808 chugs along nicely while the track seems to slowly fall apart in a k-hole of drums, blips and ominous melodies with every new bar. In short, it’s a perfect pick for the Perlon catalog. A Guy Called Gerald’s sole outing on Perlon came as a bit of a surprise, but a track like “Moon Jelly” sits very comfortably between Portable‘s “Knowone Can Take Away” and Baby Ford’s “Gravy Train”. On a big sound system, the massive bassline will pleasantly massage your chest cavity like few others, while a shimmering harp melody and dubby effects guide you into altered states of awareness. Perhaps it was a surprise to listeners when the first album from avant-garde dubstep producer Shackleton appeared on a label known for leading the minimal revolution. But not only did the music pass surprisingly well with Perlon’s penchant for groovy minimalism and intricate drum work—it also counted as another example of the label’s knack for identifying and promoting dynamic trends and developments in dance floor sounds. Besides, Villalobos himself had already bridged the gap years before with his now-infamous, epic remix of Shackleton’s “Blood On My Hands”. Thus “(No More) Negative Thoughts” and the mini-album it appeared on, Three EPs, brought the minimal and dubstep crossover full circle. As the union between a Perlon staple (Mayaan Nidam) and an experienced selector in scene associated with the label (Vera), Mara Trax was a natural fit for the label. “Murphy’s Laugh” is all chill, but the chunky drums make it compatible as a proper and tech-y tool. “Lockdown Party” proved that, even 94 records in, Perlon was still a hit-factory. If you didn’t hear the “Crossfaderama” rework by house icon DJ Sprinkles in 2013, did you even go out? In some ways, this syncopated rhythm could be seen as an extension of Perlon’s forays into dubstep-indebted genres that led to the release of Shackleton’s Three EPs. But perhaps that does an injustice to the fresh perspective Perlon vet Margaret Dygas provided on her most recent contribution to the label. Slinky, subtle, syncopated, rhythmic and complex: this is Perlon at its finest. Binh’s introduction to the Perlon stable speaks to the label’s ability to remain relevant and inspiring by enlisting fresh faces from the cutting edge of the minimal-indebted music scene it played such an integral role in developing. Berlin-based Binh is no newcomer, but he has risen to prominence in recent years thanks to his role in pushing the genre into new but related pastures that keep the Perlon-related sound fresh even 19 years after its inauguration. The title track on his album, Noah’s Day, is devoted to his young son, and the cute hooting sounds and squelchy acid notes evoke a sense of good-natured wonder that we associate with li’l rugrats. But importantly, it’s also underpinned by Binh’s signature shuffly, marching drums. Cute—and effective.